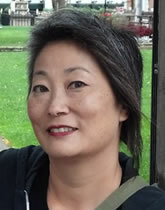 Lisa Nakamura is a professor in the departments of American Cultures and Screen Arts and Cultures at the University of Michigan, Ann Arbor. Nakamura has been writing about digital media since 1994. Her book, Digitizing Race: Visual Cultures of the Internet, discusses the visual cultures of the Internet and the type of information we seek online. She is interested in the emergence and immense popularity of racially themed websites that are created by, for and about people of color. Ricardo Dominguez, Associate Professor in the Visual Arts Department at UC San Diego, is a co-founder of The Electronic Disturbance Theater (EDT), a group who developed Virtual-Sit-In technologies in 1998 in solidarity with the Zapatista communities in Chiapas, Mexico. Electronic Disturbance Theater/b.a.n.g. lab’s recent project with Brett Stabaum, Micha Cardenas, Amy Sara Carroll, Elle Mehrman, *Transborder Immigrant Tool* (a GPS cellphone safety net tool for crossing the Mexico/U.S border was the winner of “Transnational Communities Award” (2008), this award was funded by *Cultural Contact*, Endowment for Culture Mexico-U.S. and handed out by the U.S. Embassy in Mexico.. *Transborder Immigrant Tool* was exhibited at 2010 California Biennial (OCMA) and a number of other global exhibitions. The project was also under investigation by members of the U.S. Congress in 2009/10, and was reviewed by Glenn Beck in 2010 as a gesture that potentially “dissolved” the U.S. border with its poetry. Ramesh Srinivasan, Associate Professor at UCLA in Information Studies and Design-Media Arts, is a scholar of media and culture – studying the modes by which new media technologies shape and are shaped by social, cultural, economic, and political dynamics. He has worked with a variety of communities ranging from activist bloggers to rural Indian communities to indigenous peoples worldwide. Dr. Srinivasan’s studies of bloggers and activists has focused on participants in recent revolutions in Egypt and Kyrgyzstan. His work in India has involved collaborations with rural and urban disenfranchised populations in India to study how media literacy may shape collective action. And his work with Native American communities considers how non-Western understandings of the world can introduce new ways of looking at technological design and deployment. Dr. Srinivasan’s media appearances include several TEDx talks, National Public Radio, Al Jazeera, The Young Turks and Public Radio International. He has also published pieces for Al Jazeera English, the Washington Post, and the Huffington Post. His work bridges cultural studies from anthropological and sociological perspectives with key topics in design and computer sciences. He is currently working on a book that looks at power, voice and identity in an era where digital media technologies are increasingly ubiquitous. Gabrielle Foreman is an award-winning teacher, scholar and adviser in the fields of African American Studies and nineteenth-century literary history and culture. Foreman is the author of Activist Sentiments: Reading Black Women Writers. At University of Delaware, she is professor of Black American Studies, an associate with the Center for the Study of Diversity and the Ned B. Allen Professor of English. Perry Bard is an artist living in New York. She works individually and collaboratively on interdisciplinary projects for public space. She has worked with community groups to address issues of media representation engineering site specific public video installations for the Staten Island Ferry Terminal Building in New York and for Market Square in Middlesbrough UK. Public interventions about the war in Iraq include a mobile truckside billboard traveling the streets of New York, magazine ads and coffee cup sleeves featuring artifacts missing from the Baghdad Museum. Her web and public space project Man With A Movie Camera: The Global Remake invites participation in a mashup of a 1929 film belonging to world cultural history. The award winning work has been has been named by Google one of the 106 most creative uses of the internet. It has been installed in over 50 venues to date including museums and galleries and screened on public LED displays. Bard also curates and writes for Afterimage Journal of Media Arts and Cultural Criticism. Exene Cervenka is a singer, artist and poet whose work traverses virtually every aspect of those disciplines. She is best known for her work as singer for the legendary punk band X, one of the leaders of the late-’70s/early-’80s California punk explosion. She has also issued solo albums, launched several side bands, and penned books. Exene’s political commentary, art, and music videos can be experienced at her Y0uTube channel, “Christine Cervenka”. Tattoo legend Freddy Negrete is known as one of the innovators of the Chicano style black and gray fineline tattooing. A Southern California resident, Freddy got into tattooing at an early age. He designed the tattoos for the movies Blade (1998) and Bound by Honor (1993) and has been consulted on a number of projects about tattoo culture. Rheim Alkadhi is an artist who operates in narrative and visual fields via digital ephemera, social intervention, and by investigating the quality of solid matter. She grew up as a dual citizen of Iraq and the United States. She is currently based in the Arab region. Beth Coleman is Assistant Professor of Writing and New Media in the Program in Writing and Humanistic Studies and Comparative Media Studies and the Massachusetts Institute of Technology. She is faculty director of the C3 game culture and mobile media initiative. Her fields of research interest include new media, contemporary aesthetics, electronic music, critical theory and literature, and race theory. Under the name M. Singe, she co-founded the SoundLab Cultural Alchemy project, established in 1995. Her book, Hello Avatar: From Virtual Worlds to X-Reality (MIT Press, 2010), is on virtual world design and the impact of networked identity. Petra Kuppers is a disability culture activist, a community performance artist, and Professor of English, Women’s Studies, Art and Design and Theatre at the University of Michigan, and she also teaches on the MFA in Interdisciplinary Arts at Goddard College. Her books include Disability and Contemporary Performance: Bodies on Edge (Routledge, 2003), The Scar of Visibility: Medical Performance and Contemporary Art (Minnesota, 2007) and Community Performance: An Introduction (Routledge, 2007). Her most recent book, Disability Culture and Community Performance: Find a Strange and Twisted Shape (Palgrave, 2011), which explores arts-based research methods, won the Biennial Sally Banes Prize by the American Society for Theatre Research. She leads The Olimpias, a performance research collective (www.olimpias.org). 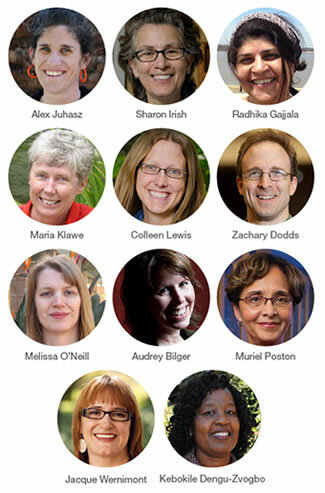 Professors and administrators shared a variety of projects and initiatives at The Claremont Colleges that focus upon innovative efforts to improve the education of girls, women, and under-represented populations in STEM fields and others that rely upon technology.